Comes standard w/ easy insert. Take to your local eye doctor and have them fill the insert with you prescription. Or buy an insert 2150I on our webshop with your prescription! These exclusive stylish frames from Wale use polycarbonate lenses which are both lightweight and scratch-resistant. They filter the sodium flare and UV similar to glass Didymium or ACE lenses. Theses glasses weigh 34 grams without the insert. 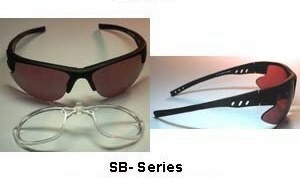 Lens Options: The SB-Series of eyewear is slightly darker than the “S” series. The glasses in the “SB” series would typically be used by the soft glass or clear borosilicate glass lampworker, glassblower, and kiln worker. Offers Sodium Flare, UV, and IR protection.